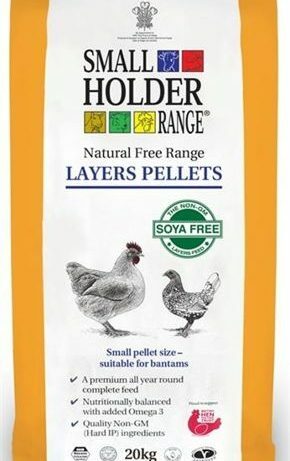 Smallholder Range Natural Free Range Layers Pellets provide a complete, nutritionally balanced diet, for healthy alert hens. 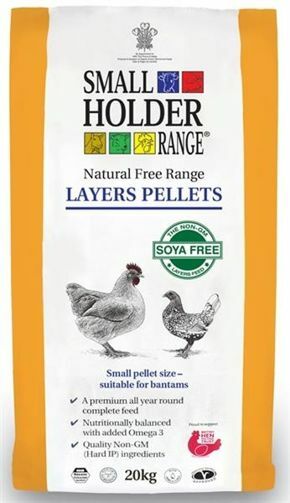 Made from quality Non-GM ingredients, soya free and with added Omega 3, Natural Free Range Layers Pellets contain no artificial colours and is Vegan Approved by the Vegetarian Society. Boosted with vitamins and minerals, they provide everything your hens need for optimum health all year round. • Smallholder Range only include natural ingredients such as Marigold leaf for lovely golden yolks and a deep rich taste. For good strong egg shells and optimum nutrition, treats should only be fed in the afternoon, after your chickens have eaten their pellets and no more than an egg cup full for each bird should be given.